Candles provide the standard jack-o-lantern light, but there are many other options today. 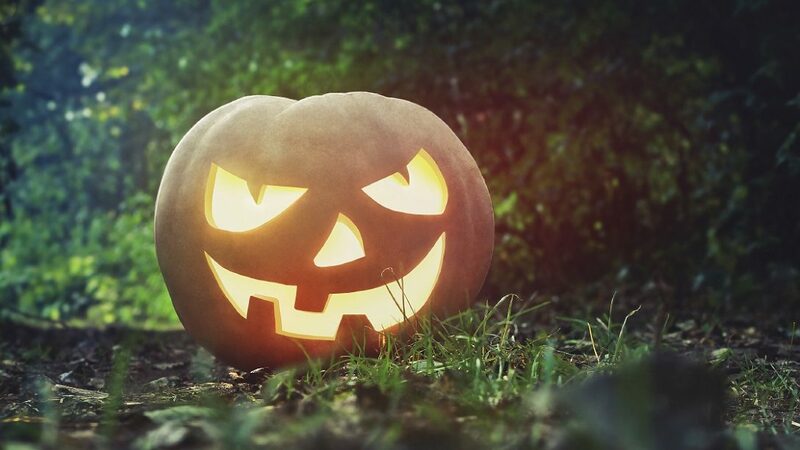 You can use battery-powered LED lights, and you’ll avoid heating up the pumpkin, as well as reduce the fire risk. Some do-it-yourselfers get really fancy with homemade circuits, LED lights, batteries, and push-button switches. Check these ideas out if you’re feeling handy. Get a jump on those trick-or-treaters by making your jack-o-lantern let loose a blood-curdling scream as they’re approaching your door. It’s easy enough to do with a battery-powered recording module. Find a recording device with a push button switch at an electronics store. One button on the module records anything you say for 10 or so seconds, while the other plays the sound back. You’ll need to carve a spot into the inside of your pumpkin for the device to sit, and a small hole on the outside so you can push the button when you see trick-or-treaters approaching. As they’re coming up the drive, push the button and let ’er rip! What’s better than a jack-o-lantern lit up from the inside? How about a jack-o-lantern with eyes that follow you, or whose scary mouth is full of flickering flames? If you can find a video that plays the scary scene you need to complement your design, you can make it happen. Pick a video to incorporate into your pumpkin design and load it onto your device. You can find them on YouTube, of course, but others are available via the HallowEyes video pack from Hallowindow.com (link: http://hallowindow.com/). Tape the sketch onto the side of the pumpkin and use a pin to poke small holes around the design’s outline, or cut the sketch into a paper template you can lightly trace onto the pumpkin with a pencil. On the other side of the pumpkin (this will be the back when you’re done), cut a hole you can fit your device through. Scrape all the innards out of the pumpkin. Cut small holes in the middle of the area(s) where you’re planning to cut the design.You’ll use these to check alignment before you carve. Seal your device inside a thin zip-top plastic bag to protect it. Turn on the video, and fit the device inside the pumpkin. Line it up with your pin holes or sketched design, using the small alignment holes. Remove your device, and carefully scrape a thin, device-shaped spot about 1/4 inch deep into the inside wall of your pumpkin. Check for placement regularly, and don’t make it too deep. Once you have the inside spot carved out for the device, practice placing the device—inside the plastic bag—in the right spot, and securing it with toothpicks. Once the placement works perfectly, remove the device again. It’s finally time to carve! On the outside of the pumpkin, carve your design. Stick to the exact template, and make sure you don’t carve away the edges of the slot you’ve carved on the inside. If you don’t have an app that supports video repeat already, check the app store for your tablet or phone OS. They’re available for most platforms. Insert your plastic-bagged video device and secure it with toothpicks. Then, play the video on repeat. Try not to have nightmares. Needless to say, if the pumpkin is outside, don’t leave your device in the pumpkin when you’re not standing with it, and definitely don’t use a candle in this pumpkin!